I made it, safe and sound to go visit my family. Are you impressed I survived my 58 minute flight? Yay for me!! I would like to think of myself as a proficient traveler. I know the rules: I pack light, I breeze thru security, I feel at ease strolling thru airports, and I always check in before hand. I enjoy traveling; going places and the adventures before me. The actual flying part is torture. I am absolutely NO good at sitting still, and not just in airplanes. I can't sleep in planes (or cars). I am just so darn excited to go do things, sitting still is not one of my strengths. On this particular this flight my seat mate was a 60 plus woman who didn't want to chat; kept her book quite decidedly in front of her face, smelled faintly like cigarette smoke (yuck) and hogged the middle armrest leaving me leaned against the window. The flight itself was not long enough to have an epic battle over the arm rest with the woman, so I leaned against the window and listened to my iPod, until it ran out of battery. Haha. How did I forget to charge my dang iPod? And my cell phone…. Anyways, I looked and the top sides of clouds, snow peaked mountains, rivers and lakes an unbelievably blue color. It was gorgeous. Before I knew it, we were landed! Have a great weekend, the weather here is supposed to be beautiful, and I'll tell you all about our adventures next week! 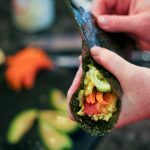 Some tips for rolling the cone, make sure your hands are completely dry, or the nori will stick to you. Chop the scrambled eggs into small chunks to give rice type texture. We watched this short tutorial. 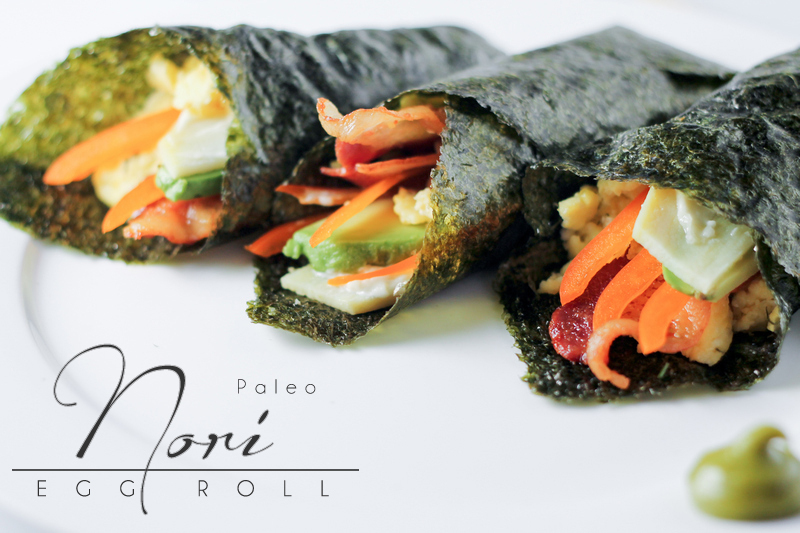 Paleo nori wraps are a great finger food, appetizer, breakfast, or light meal! Lay bacon out on a sheet and pop in the oven 350 F for 35 min, or till desired crispy-ness is achieved. Thinly slice sweet potato, and set a pot of water on to boil. Once boiling carefully lay sweet potato strips in the boiling water, and remove from heat. after 5 min, drain and set aside. Over cook them and they will be mushy. Thinly slice pepper and avocado, squeeze one half a lemon over the avocado. It adds flavour and prevents browning. Combine eggs, dill, and butter or ghee, and whip. Scramble eggs over medium heat, approximately 4 minutes. Chop eggs up into smaller chunky to give you a rice type texture. 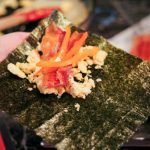 With a nori sheet in hand, spread a square of scrambled eggs in the top left corner. 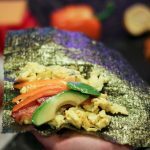 Lay a slice of bacon folded over, 2 slices of avocado, 2 slices of pepper and one slice of sweet potato diagonally in the egg square. Put a half of a teaspoon of paleo mayo on the sweet potato (to keep the nori dry). 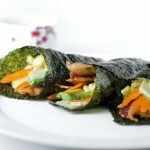 Fold the left side of the nori sheet into the middle and wrap the remainder around the outside creating a cone. 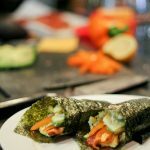 I don’t know anything about nori sheets. Where would I find them in a small town? Do the big grocery stores carry them and where are they in the store. What are they made from? 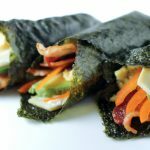 Can you make these wraps ahead of time and take on a picnic or trip? Have a great time with those young ones! So many good questions!!! 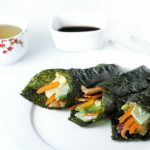 Nori is a dried seaweed sheet, they can be found in most grocery stores that have an international section, or natural food stores, also good old amazon. If you don’t see them you can ask at the local sushi spot, (if you have one). Heck I’ll even mail you some if you can’t find them in your small town!! 😉 You could absolutely premake these beauties for a picnic or road trip, and they are easy to eat on the go!! I have a whole list of things us kids have been up to. As always, action packed, they will be begging for me to go home so they can rest! Thanks, Holley, I will have a look around. Hope you are rested up from all the action packed time with the kids! Such a great idea. 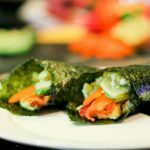 I tend to use lettuce or cabbage wraps for most wraps, but always forget to consider the nori option. 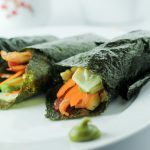 The best thing about good nori is the texture. I think food that doesn’t require utinsels is just about the best thing since sliced veggies.